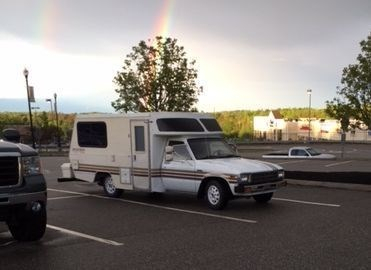 After searching for year and a half on Craigslist from coast to coast nightly for various toyota campers, we had come to the conclusion it just wasn't meant to be. One Morning before work a quick craigslist search yielded this funky 1983 born jem - After an email to the owner (Eleanore) we were disheartened to hear that 5 other people/couples were already lined up for a showing before we could get out of work and get first refusal - Dang! Impatiently waiting all day and working like fiends, we happily made our trek from Portland to Arundle (approximately 30 minutes) for viewing . The exterior was in need of some TLC, but the interior...well, you can see for yourself, what's to no fall in love with!? Then came the moment of truth - How does it run? With a twist of the key the vessel belovedly named Neige came to life, and ideled like a purring Tiger. All estimated 100 horses ( New it pushed out 130hp) ready for a road trip. After the bumpy test ride, mostly they dry rotted tires, we made an offer and our journey begin. These Campers were built in Colton, CA 92324 by Sandtana Industries, Inc.
Click Here For More Photos, and Feel Free To Follow Us!